Britain's Benjamin Creme is today's most powerful voice challenging the millennial 'prophets of doom' with his compelling and detailed vision of the future - what he calls a "brilliant new civilization in the making." 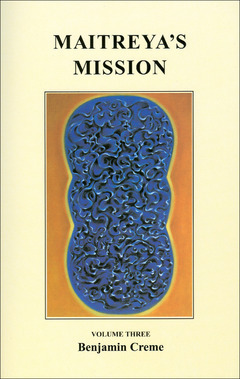 In this third volume of Maitreya's Mission, Creme covers topics both profound and practical, ranging from mankind's origin to the principle of sharing as the first step toward global peace; from meditation and service to the technology of light; from reincarnation and karma to a pollution-free environment. A section on miracles explains the source and purpose of weeping Madonnas, crosses of light, healing waters, 'milk-drinking' statues, crop circles and more. Benjamin Creme's message holds a unique place in today's world. It offers a practical application of the ancient wisdom underlying all faiths. It provides the blueprint for a society that offers the basic necessities of life to all. It is the assurance of a hard-won but glorious future for humanity. "The new millennium is not the end," says Creme, "but rather a hopeful new beginning." Humanity today is living at a unique time in its history. The events that I submit are now under way will transform our lives, our world, in the most fundamental, radical fashion, within a relatively short number of years. We are at the end of a civilization, and therefore at the beginning of a new one: if we would have it so, this can be the most brilliant in our long history. Most people will know that we are entering a new era, a new cosmic cycle. We call it the Age of Aquarius because of the particular relationship now being formed in space between our solar system and the constellation of Aquarius. In its cyclic movement around the heavens, our solar system has come into a definite energetic alignment with that constellation, which will continue for the next 2,350 years, more or less. This alignment causes the Earth to become saturated with the cosmic energies of Aquarius. Every civilization, beginning roughly every 2,000 years, is the result of this changing cosmic relationship. As we near the end of the century, a powerful thoughtform of destruction is gripping the minds of millions of people. Throughout the world there is a 'doomsday complex'. As a result of misunderstanding the prognostications of people like Edgar Cayce, Nostradamus and others, people have the idea that towards the end of the century there will be some great catastrophic event in which the world will be physically changed: mountains will rise and many countries, perhaps continents, will sink under the sea. This belief is widespread and it comes largely from a misunderstanding of history and of scriptures which seem to point to such an apocalyptic end to the world. As we enter a new age, everything changes. Political, economic, religious and social forms inevitably change under the impact of the new, powerful, cosmic energies that enter our lives. The foretold destruction I believe is altogether exaggerated. Countries will not go under the oceans. The oceans will not rise as mountains. The cataclysm which has been foretold by so many, emanating in the main from the astral planes ― the planes of illusion ― has little foundation in fact. Change there will be, but change for the better. We are about to enter an era in which the innate spiritual nature of humanity will begin to express itself in a mass form. Countless millions throughout the world will awaken to the true purpose of their lives. A deeper, more soundly-based attitude to life will develop and people will recognize themselves as souls ― souls in incarnation. They will come to understand the purpose of their incarnation, and, more and more, they will take a conscious part in their own evolution, creating modes of freedom and justice which this world has never before seen. Freedom and justice, and therefore peace, will allow the divine, spiritual aspect of humanity to come to the fore and be given expression, not only as a religious experience, but in every department of life. In politics, economics and education, in art and science, the inner awareness of our spiritual nature will increasingly be demonstrated. This will allow the discovery of a science, and the control over the forces of nature, which will give humanity unlimited power over its environment. All of this awaits us as we enter the new cycle. Far from destruction, we shall enter an era of unprecedented creativity and beauty of life. And this in large measure because of the re-entry into our lives of a group of men without fault, spiritual giants ― from our point of view, perfected men. These are men who have gone ahead of us in evolution, and have completed the journey on which we are still engaged. They need no longer live on this planet, but accept the responsibility of remaining here to guide the rest of us to that same perfection. They have many names: the Great White Brotherhood, the Society of Illumined Minds, the Elder Brothers of humanity, the Teachers, the Guides, the Mahatmas, the Masters of Wisdom and the Lords of Compassion. Cycle after cycle, one of these Great Ones has come into the world to teach humanity the way forward, the next step in our evolution to perfection ... Some 2,600 years ago, Gautama Buddha prophesied that at the beginning of this cycle there would come into the world another great teacher, a Buddha like himself, by name Maitreya. Maitreya, he said, would inspire humanity to create a brilliant golden civilization based, as he put it, on Righteousness and Truth � In June 1945 ― significantly at the end of the Second World War ― the Lord Maitreya announced his intention to return to the world at the earliest possible moment, if humanity would take the first steps to put its house in order. He said he would come when a measure of peace had been restored to the world; when the principle of sharing was beginning to govern economic affairs; and when the energy of goodwill, the lowest aspect of love, was manifesting, and leading to the establishment of right human relationships ... This event would be the externalization of the activity of the Masters for the first time in nearly 100,000 years. ―The Book Reader The latest volume in the series clarifying the mission of Maitreya, the World Teacher, and his disciples the Masters of Wisdom. Again, published in easily digested format of questions and answers. The future is bright for humanity. Peace. Sharing. Conservation. The broadening of consciousness. Yes, and beauty. Everything you can imagine ― actually, everything you can intuit ― is here in this book. Illusion, reality, the meaning of angels, devas, spiritual valuations of ten famous painters, earthquakes, education, ringing in the ears, healthy eating, the inhabitants of Jupiter, spiritual interviews. Point? "To consolidate the treasure of the past and inspire the marvels of the future." In the back, a list of initiates, their rays and stages of evolution. Also, a very useful, complete glossary of terms. Creme is consistent, perceptive, a believer in the evidence of things not seen. "We are spiritual Beings, literally gods, who reflect themselves on the soul-plane as the human soul, which acts as an intermediary between that divinity and the personality on the physical plane." An eloquent and absorbing expedition into the shape of reality. ―Matthew Gilbert, NAPRA Review For the past 20 years, Benjamin Creme has been the spokesperson for the spiritual teachings of Maitreya ― Christ's Second Coming - and his disciples, the Masters of Wisdom; he is a passionate believer in a near-future of transformed global consciousness. A number of books have been spawned by his dedication to and psychic contact with the Masters and Maitreya, including two previous volumes on 'the mission'. This third in the series focuses more intently on the future while it explores such topics as karma and reincarnation, the origin of humanity, meditation and service, and the Plan of Evolution. The emphasis is decidedly upbeat as visions of a brilliant tomorrow filled with 'self-realized' humans are frequently invoked amidst a wealth of other material (nearly 700 pages worth). The timetable for these changes comes across as somewhat variable, but the message is clear that in 15-20 years a great leap will have been made at all levels of our being. This is a meaty presentation that in answering many questions raises just a few more. ―Kendall Klug, Vision Magazine Maitreya's Mission, Vol. III is filled with a tremendous amount of wisdom on a huge range of topics and offers practical solutions to many of our most challenging problems. Those who read this book will find themselves on an accelerated journey into the realms of consciousness that will change their world forever. ―David Dohrmann, Access Benjamin Creme is � optimistic about what is to come, certain of his mission, and erudite in the manner in which he communicates. Having studied and appreciated the writings of Alice Bailey (which, along with Blavatsky's writings, form the foundation of Creme's teachings), my own hope is that the dramatic changes which he predicts will actually come to pass. I also look forward to what he refers to as the 'externalization of the hierarchy', because those of us who feel we are here to help usher in the changes need all the help we can get, from this side as well as the other�Creme speaks clearly and knowledgeably about what he believes is required to remedy many of the problems that now beset mankind, and much of this is in the form of brief articles and question-and-answer sessions, which makes interesting 'pick-up' reading. His discussions of timelessness, the art of waiting, the nature of evil, meditation, and the initiatory process, among many other subjects, are fascinating reading. If one is interested in a book that is down-to-earth and far-out at the same time, I strongly recommend it.